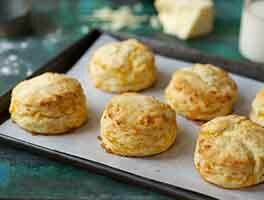 Here it is - the very easiest way to make tender biscuits. 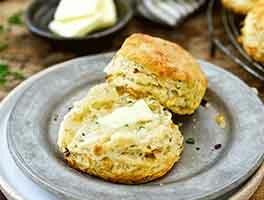 Rather than cutting or rubbing butter into flour, then adding liquid, these biscuits are a simple matter of stirring cream into the flour and other dry ingredients. Pat into a round, cut, bake, and enjoy! Our Guarantee: These 2 1/4" biscuits will be golden brown on top, lighter-colored on the sides, and about 1" to 1 1/4" tall. They'll be very tender hot from the oven, and will gradually become less so as they cool. Whisk together the flour, cornstarch, salt, baking powder, and sugar. Stir in enough heavy cream to moisten the dough thoroughly. You'll probably use about 1 cup in the summer, 1 1/4 cups in the winter, and 1 cup + 2 tablespoons at the turn of the seasons. You want to be able to gather the dough together, squeeze it, and have it hang together easily, without dry bits falling off. Turn the dough out onto a lightly floured work surface, and very gently pat it into an 8" circle about 3/4" thick. If you're uncertain about your ability to make a nice freeform 8" round, pat the dough into a lightly floured 8" round cake pan, then turn it out onto a lightly floured surface. Use a sharp 2 ¼" biscuit cutter to cut rounds. Place them on a lightly greased (or parchment-lined) baking sheet. Brush the biscuits with butter, if desired, for extra flavor. Place the pan in the freezer for 30 minutes. This will improve the biscuits' texture and rise. Preheat the oven to 425°F while the biscuits are in the freezer. Bake the biscuits for 20 minutes, till they're golden brown. Remove from the oven. If you have any melted butter left over, brush it on the baked biscuits. Serve immediately. 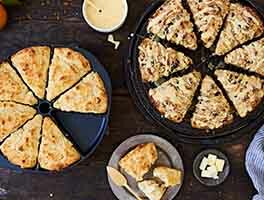 Easiest way to cut biscuits? Pat the dough into a 7" square. Use a sharp knife to divide the dough into nine squares. Hey, nobody said biscuits have to be round! Why the cornstarch in this recipe? It lowers the protein of the flour, which in turn produces a more tender biscuit. Can you use milk or buttermilk instead of heavy cream? Of course. 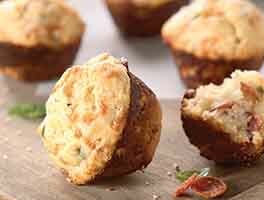 You'll need to use a bit more, and your biscuits won't be as tender-textured or rich-flavored. You don't have to use a 2 ¼" biscuit cutter. Use whatever size you have, understanding that larger biscuits may need to bake a bit longer, and smaller biscuits a bit less time. It's important to use a sharp cutter; the sharper the cutter, the cleaner the cut, the higher the biscuits will rise. They are delicious. However they tend to spread o. The bottom when baked. What would make them do that? Hi Kathy! A couple of things could cause this. One, if the oven wasn't fully preheated, the dough could have begun to spread/melt a bit before the outside had a chance to set. Preheating for a good 30 to 45 minutes and making sure your oven is reading true to temperature with an oven thermometer can help with that. These are absolutely delicious! I bake these instead of my family recipe. However, my biscuits tend to spread at the base. The only thing I did differently was use all purpose, bleached flour. Thanks! I usually follow the KA self rising biscuit recipe, which I love, but I had leftover heavy cream so I decided to try this. Followed recipe exactly. Texture and rise was perfect. My main complaint is they seem to have a very bitter taste. Not sure where it came from since so many other people seem to like the flavor. Oh well, back to my old standby with butter and SR flour. Worked perfectly! Measured using grams (kitchen scale) instead of measuring cups (volume). King Arthur has taught me that weighing ingredients when baking works the best to match the recipe results! Will make again. Sorry I haven't actually made these. 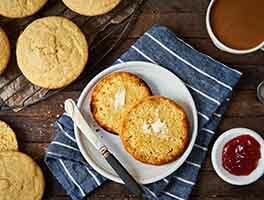 I am looking for a biscuit recipe that I can make a large batch and freeze. So I can pull them out as needed for meals. Can I do that with the king Arthur biscuit recipe? If anything add active yeast you could go no wrong without it, I live in area where fog and cold weather happens often even though weather man says hmm it be sunny all day. Really its not sunny today its foggy again and it means timing of keeping everything rising will need extra boost. So here my question for bakers at king Arthur flour do you add anything else to your biscuits. I like to experiment like food that tastes good and make more meaty biscuit or something taste like fish...it gives me energy to last through the day or feel like I eaten a hearty meal. But then if you add to soup that is bland it make feel like your adding some zest in your day. SO for add-ins for anyone else to try I used herbs, Italian herbs, parsley, rosemary, sage the like which tastes very good. But Something works in harmony with fish would be thyme. I could be wrong, Tuna with cheese and herbs work and taste really good. with bit of yeast into mixture helps great deal. I rather prefer baking soda then baking powder, maybe I just add 1/4 of powder rest of way is soda because. for me I prefer protein so, I might add one egg, 1/4 cup of yogurt plain to give it buttermilk taste if that what people want to experience. 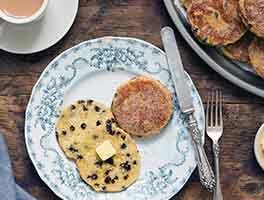 I recommend if rather have rich tasting biscuit you could go use blender use unmelted butter but melting butter seems insane... if your into instant done stuff I rather prefer to see lumps and holes that make it appear tasty. We don't have heavy cream in house normally half in half I love my milk I prefer to keep it not used in cooking. Normally we have heavy cream to spare but that stuff only lasts one month, when I get it strangely its always on hot days and never time to make what I want to make. Half and half has baking and cooking consistency of tasty. It has a similar richness to heavy cream but you work with it. I hope this finds you and makes your day just as interesting. I can never seem to get this recipe right. Either it's too dry or too moist. I followed the recipe exactly. I used regular milk and it said you will have to use more but it ended up being a soupy mess. Baked these last night. We ate along with bacon and scrambled eggs. Wife and daughter thought they were scrumptious. Wife said they were as close to her Grannie's biscuits she has ever eaten. I said they tasted exactly like my mom's biscuits, I didn't like them either. To me, they tasted like Baking Powder and Flour. I know, why wouldn't they? We ate them with butter and grape jelly. At home we had them with "Creamed Chicken" and other gravies. We make "Dried Beef Gravy" so I would maybe like them that way. I made them with a 2 3/4" biscuit cutter. Pressed the dough to about 3/4" with my fingers. They rose beautifully and were definitely light and fluffy. I needed to add about 1/4 cup of cream to make the dough come together. Humidity in our home kitchen at about 40%, temperature at 72 degrees. Baked them at 375 degrees in convection oven for 35 minutes. They were perfect. I have never baked anything at over 375, I am a young eighty three years and do most of the baking except for pies. I taught my wife to make pies many years ago. Her pies are to die for.